Shall not attempt any long article upon the subject chosen, as the tokens to be described possess no points of special interest beyond that which is attached to them for their numismatic value. A glance is sufficient to show that they were not issued from any desire to furnish that which should be a thing of beauty; on the contrary, they are deficient in almost every point which might claim admiration for artistic taste, or excellence of workmanship. As choice gems of the engraver's art, they will never be sought after, but as numismatic treasures, they are worthy of, and receive considerable attention. Many an anxious hour has been spent in search of an Owen or a Molson, but the desire to possess the former is rarely fulfilled, and I believe there is but one Canadian Collection in which it is to be found. 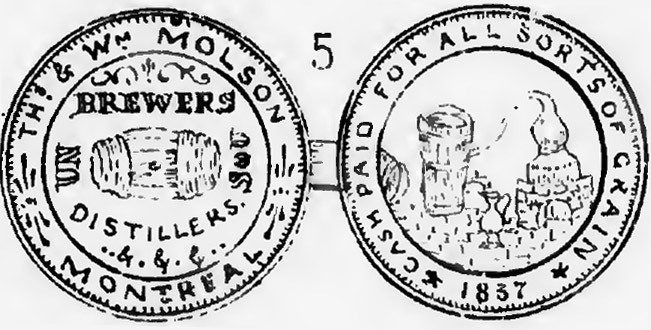 Unlike some American or English issues, the Montreal tokens bear no political devices, nor do they serve to perpetuate the memory of any particular hero, or public event. Theirs was no sentimental mission, and the numismatist needs not the aid of the historian to learn the object for which they were issued. With two exceptions, the dies were prepared in Birmingham, England, and although in some instances, the exact date of issue cannot be ascertained, I believe I am correct in arranging them as I have done. I may add that the illustrations are from specimens in my own collection (the Owen excepted). Mr. Owen carried on an extensive business in the East End of the city, for many years prior to 1837, but as to when the token was issued, there is no reliable information. Mr. Owen's establishment was destroyed by fire some years after the date named. Obv. A ship under sail to right. Rev. Within a circle of cordage, R. W. Owen, Montreal Ropery. This token was issued in June, 1832. Mr. Brown imported about eight hundred pounds' weight, and as the tokens were made sixty to a pound, the number placed in circulation was nearly fifty thousand. The cost, including the expense of dies, was one shilling and five pence sterling per pound. A great scarcity of change existed when these were issued, and Mr. Brown experienced no difficulty in disposing of his business cards at the rate of fifty cents per pound, thereby securing a handsome profit of about one hundred per cent. Obv. T. S. Brown & Co., Importers of Hardware, Montreal. Rev. An anvil, hammer and tongs, between a scythe blade and vise, above which are two spades crossed. Mr. Joseph Ray carried on business in Montreal for over half a century, and retired in October, 182, when the premises occupied by him were destroyed by fire. He was a prominent man in public affairs, having represented the East Ward of the city in Parliament, when the troubles of 1837 broke out. He was also a justice of the peace, a commissioner for the erection of parishes, &c. He died July 31, 1856, aged 84 years. This token was issued in 1833, the dies having been prepared, and the tokens struck in Montreal. This is, therefore, the only token of home manufacture. The number issued is not known. A very fine specimen sold in New York in April, 1871, for $2.50. Rev. Within a wreath Un Sou. Jh. Ray, Montreal. Mr. Mullins emigrated from Ireland in 1821, and three vears later commenced business in Montreal. Some years after he proposed admitting his son into the business, and these tokens were ordered from Birmingham. The business arrangements were not carried into effect, and the tokens bear the name of a firm which never existed. Mr. Mullins imported four kegs of about 400 pounds each. Three of these kegs were forwarded to Western Canada (now Ontario) but the vessel in which they were shipped foundered upon Lake Ontario, and the tokens were lost. Taking the average weight, the number actually placed in circulation was about twenty thousand. Obv. Francis Mullins & Son, Importers of Ship Chandlery, Montreal. Rev. A ship under sail to right. "Commerce token." Heavy milled edge and rim. Messrs. Thomas & William Molson were sons of Hon. John Molson, whose name stands so prominent in the annals of Canadian history as having fitted out the first steamboat that ever ploughed the waters of the St. Lawrence, and the second built upon this continent. In partnership with his sons he carried on business under the firm of John Molson & Sons. On his decease in 1836 Messrs. Thomas & William succeeded to the business, and in 1837 they procured the dies for these tokens from Messrs. Rawdon, Wnght & Hatch, of New York. The actual value of the tokens being above that of a half-penny, their circulation was anything but a profitable investment. A very small number was issued, certainly not over jj^ioo worth. The dies are at present in the possession of Messrs. John H. R. Molson & Bro., who carry on an extensive business as brewers and sugar refiners. A fine specimen sells at from $1 to $1.50. Obv Within a circle, a cask; above Brewers, below Distillers, &c. &c &c In outer circle, Th. & W. Molson, Montreal. Rev. Within a circle, a number of distilling utensils. In outer circle, Cash paid for all sorts of Grain. 1837. Mr. Sharpley began business in 1835. In the year 1862 a firm in Birmingham prepared dies, and furnished him with twenty gross (2880) of these tokens, which were intended for distribution principally among his American customers. They somewhat resemble (in size and appearance) the English sovereign. Only a very few have been circulated in Montreal, which will account for their being unknown to the majority of Canadian collectors. Rev. Importer of silver-ware. Clocks, Gaseliers, Bronzes, Cabinet-ware, Gla.ss-ware, &c. &c. &l."
These tokens have never been put in circulation. The dies were prepared in Birmingham, and the design chosen is similar to that of the Canadian cent. They were seized by the authorities for an infraction of the currency laws, which forbid the importation, manufacture, or issue of any trade or other token, unless permission be first obtained, and bonds given for the redemption of the same. The tokens (about 8000 in number) still remain in custody of the Customs department. The highest price paid for fine specimens of the Mullins, or Brown token, has been 50 cents. No particular value can be placed upon the Sharpley token, as specimens may be obtained of that gentleman at any time, and with reference to the Devins token, it is quite probable that it may yet be placed in circulation and be quite easily obtained, although at present it is considered scarce. A first rate (or in numismatic parlance, a very fine) specimen of Owen is worth from $5 to $10, and might command a shade higher figure. Obv. Laureate head of Victoria within a beaded circle. Dominion of Canada, Province of Quebec. Rev. A similar circle inclosing the words, Use Devin's vegetable worm pastilles. July 1867. Outside of circle, Devins & Bolton, Druggists, Montreal.